Germany has a long history of body decoration. In 1988, a carved figure of a man was found in a cave at Hohlenstein-Stadel, in Germany, carbon dated at 32,000 years old. The body had markings with thin lines running across the upper arm. Friedrich Barbarossa ("red beard"), Roman king and emperor of Germany from 1152 to 1190, is often seen in illustrations with cross designs on the back of his hands. Kaiser Wilhelm, who was Emperor of Germany in 1908, was rumored to have an eagle tattooed on his chest. Of course the German ports on the North and Baltic Seas added the sailor heritage to German tattoo history. There have been many German attractions in sideshows on both sides of the Atlantic. We should not forget that the first professional tattooist in the United States was Martin Hildebrandt, a German immigrant. Nora Hildebrandt, Martin's daughter, is credited as the first female attraction in the United States in the 1860s. Following are a few of the attractions that came from Germany or made their name there. Don Manuelo, entered the sideshow world in the late 1800s with a body suit of designs that tell many stories. His back piece features a large military battle scene with an eagle and crossed flags below. On his chest he wears images of "Red Indians", sailors and women. One of Manuelo's designs was laced-up spats tattooed on his lower legs, which was a popular design with German attractions. Annie Frank arrived on the tattoo scene in the 1920s. Her tattoos consisted of many patriotic designs like Miss Liberty, eagles, crossed flag and the required laced-up spats. Angelika Schwarz's history is unknown to the Archive. This stylistic poster shows her tattoos to be mainly of animals, butterflies and flowers. 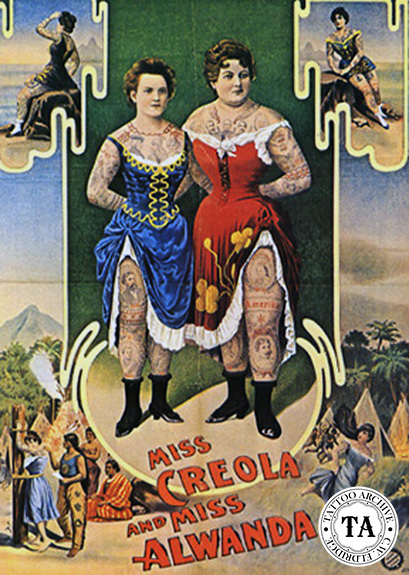 Miss Creola and Miss Alwanda, shown to the left, were one of the few double attractions in the history of the sideshow. Most of their tattoos are portraits of European kings and queens. I guess those "Red Indians" had a sense of humor. Note the spelling of America on Miss Alwanda's leg. La Bella Angora's poster has front and back views of her tattoos that feature a great chest eagle and multi-jeweled necklace (and the now common place tattooed spats). 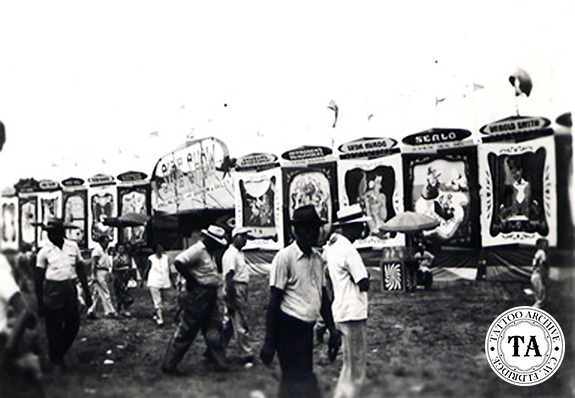 Lyda Akado worked with the American Ringling Bros. Barnum & Bailey Circus in 1954. She is seen here in a front and back pose that was sold by Bernard Kobel (#708). This mid-way shot with Akado's non-canvas banner, shown below, is also from Kobel but is only listed in his Circusiana catalog (#244). Frank and Emma de Burgh were an American couple tattooed in the 1890s by Samual O' Reilly in New York City. The reason they are included in this review of German attractions is because most of the historical information that has survived is from their work in Germany. They are seen here in a German poster with other sideshow members. Nora Hildebrandt first appeared at Bunnell's Museum in New York City in 1882 with a tattoo for every day of the year. That's right! 365 tattoos done by her father Martin. Tattooed daughters and wives became a calling card for many tattooists of this era.